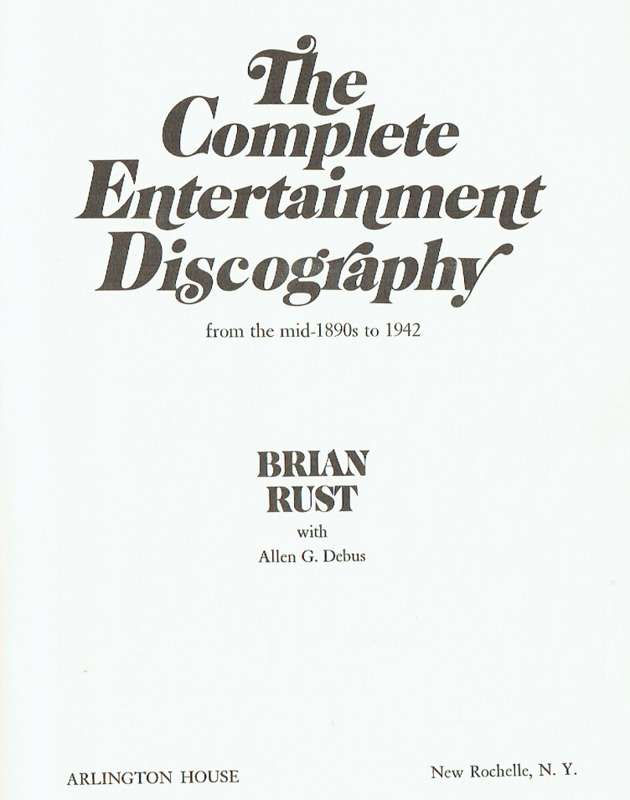 “Often described as the father of contemporary discography, Brian Rust embarked in the 1940s on a rigorous, deeply personal project that continued long afterward as he haunted archives and hunted down artists to reconstitute long-vanished recording sessions on paper. He was best known for JAZZ RECORDS, first published in 1952 and reissued many times since. For decades, JAZZ RECORDS — known to jazz mavens simply as ‘J. R.’ — has been the de facto standard reference work in the field, furnishing meticulous information on session dates, personnel and much else for tens of thousands of recordings. Aimed at scholars and aficionados, the book has also been the starting point for countless reissues of early-20th-century jazz. 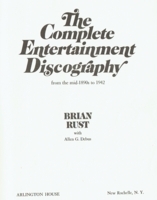 ‘Discography is a road map to the recorded past’, said Tim Brooks, who collaborated with Mr. Rust on THE COLUMBIA MASTER BOOK DISCOGRAPHY, a four-volume work published in 1999. ‘Virtually any historical jazz reissue goes back first to Rust to find out what to look for — what recordings an artist made, how many versions of each that artist made and where they might have been issued, so you can get your hands on it. And he would trace all of that’. ‘All of that’ is now standard information in discographies across musical genres, and it is to Mr. Rust, colleagues say, that such comprehensiveness is owed. ‘Jazz research at its beginnings was the purview of dedicated amateurs’, Bill Kirchner, a jazz musician and historian, said in an interview. There was no precedent to dictate what the nature of it was going to be, and what the details were going to be. And he was really one of those people who decided, ‘This is what it should encompass’. Brian Arthur Lovell Rust was born in London on 19 March, 1922. As a boy, he became enraptured by the jazz he heard on the radio and was soon spending all his pocket money on secondhand recordings. At its height, his collection comprised 8,000 to 10,000 records — a somewhat modest haul by the standards of truly obsessed collectors. With benevolent indifference to the ravages of summer heat and winter cold, Mr. Rust stored them in an extension behind his garage. After the war, he joined the staff of the BBC Gramophone Library, where he worked until about 1950. It was there, wishing to improve on the scanty discographies then available, that Mr. Rust began his private research in earnest. Reconstructing a long-ago recording session is like trying to grasp a fistful of quicksilver. Mr. Rust first scoured record-company archives to compile his data; because files were often lost or incomplete, he eventually left the BBC, packed a suitcase full of rare European jazz records and set out for the United States. Arriving in 1951, he sold the recordings to American collectors and used the money for bus fare, traveling the country in search of aging jazzmen, whom he proceeded to debrief. Although Charles Delaunay and Hugues Pannassié had been the pioneers, their work was sketchy and anecdotal, and concentrated primarily on ‘white-jazz’. Rust recognized the need to talk to the original performers and recording personnel, especially pioneers of the overlooked’race’ recording industry, before their knowledge would die away. 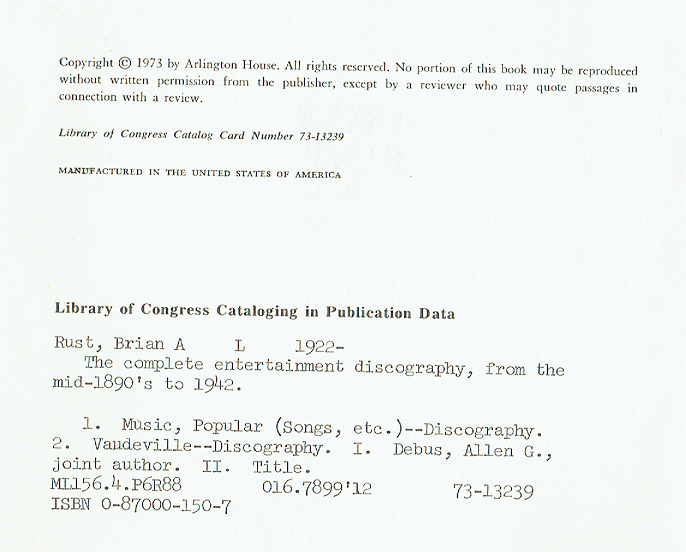 The result was JAZZ RECORDS, originally issued by Mr. Rust as a mimeographed loose-leaf volume. In the decades that followed, Mr. Rust devoted his life to freelance music writing and discography, an unremunerative, solitary but, to him and his fellow travelers, deeply necessary enterprise. He worked quietly, away from the limelight, from his home in Swanage, a coastal town in Dorset. His other work includes THE AMERICAN DANCE BAND DISCOGRAPHY 1917-1942 (1975), BRITISH MUSIC HALL ON RECORD (1979), DISCOGRAPHY OF HISTORICAL RECORDS ON CYLINDERS AND 78s (1979) and legions of liner notes. In the late 1950s and early ’60s, Mr. Rust played the drums in the Original Barnstormers Spasm Band, a British skiffle band.